Lacto-fermented foods have traditionally been used for their many healthy benefits. They promote better digestion and absorption of your food, as well as promoting growth of friendly probiotic gut bacteria. 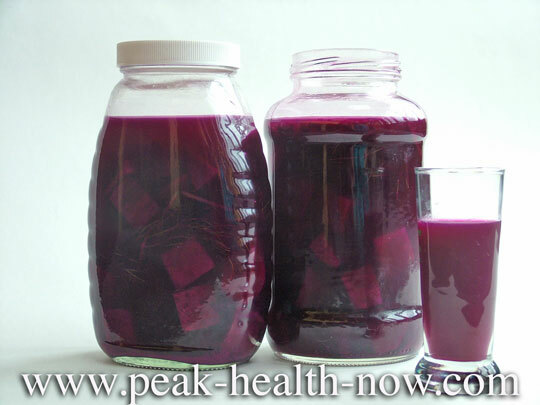 The addition of salt and a little plain, high quality yogurt (only 1 tablespoon), to cubed beets begins a fermentation process the result of which is low in carbs and free of alcohol (thanks to the salt). As the fermentation progresses, the salt taste moderates, and you end up with a tangy, slightly fizzy taste combined with the earthy flavor of beets. Some people find it an acquired taste, others take to it immediately. Just a few ounces of Beet Kvass makes a lovely after-dinner drink that imparts a feeling of well-being. Water: The purer the better. Chlorine in tap water will tend to inhibit proper fermentation. Filtered tap water is better than buying water from the supermarket in plastic containers. Make sure your filter cartridge is changed regularly. Ideal of course is clean water from a deep well or spring. Beets: Look for firm, well-shaped beets with no rotten or moldy spots. This Autumn, when I knew that Beet Kvass was going to be a staple in our home, I 'collected' healthy, fresh-looking beets from local farms when shopping at the food co-op. Beets keep quite well in the refrigerator - so my strategy was to buy them while still fresh from harvest rather than having to pick through those that were starting to spoil in the stores. Plain Full-Fat Organic Yogurt: Choose one from an organic farm with excellent reputation. Here in the northeast US, such brands as Butterworks Farm or Seven Stars Farm which uses biodynamic methods are good choices. Optional: A clove of organic raw garlic, a few chunks of fennel along with feathery sprigs, adds an exotic touch. 1 - Wash beets and other vegetable ingredients. 2 - Cut beets into 1/2 - 3/4 inch chunks - enough to fill a quart jar halfway. 3 - Put beets in jar and add 1/2 - 3/4 teaspoon sea salt. 4 - Add 1 tablespoon yogurt to jar. 5 - Fill jar with water, leaving an inch or so airspace at top. 6 - Close jar tightly enough so you will be able to shake it without any liquid coming out. 7 - Shake jar a few times to mix ingredients and set on kitchen counter for 3 - 4 days. **Be sure to shake jar several times per day. 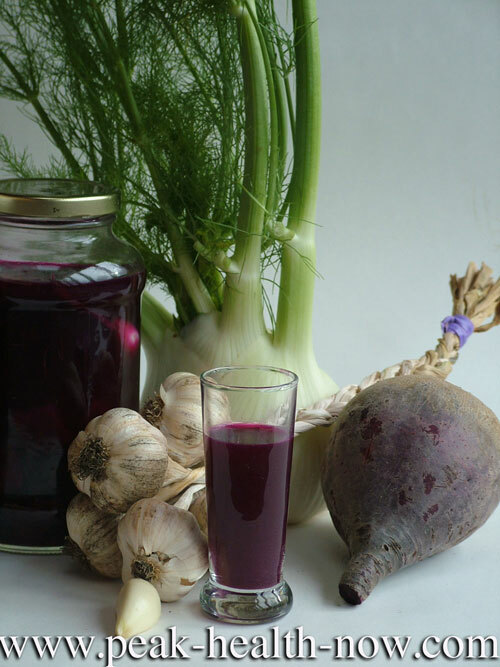 8 - Not to worry if a whitish film is seen at top of liquid; I find it is harmless and commonly disappears by the time Beet Kvass is ready for use. 9 - Unscrew cap to let out any pressure, then store in refrigerator. **Some people like to unscrew cap a few times during fermentation to let out the bit of pressure that builds up. 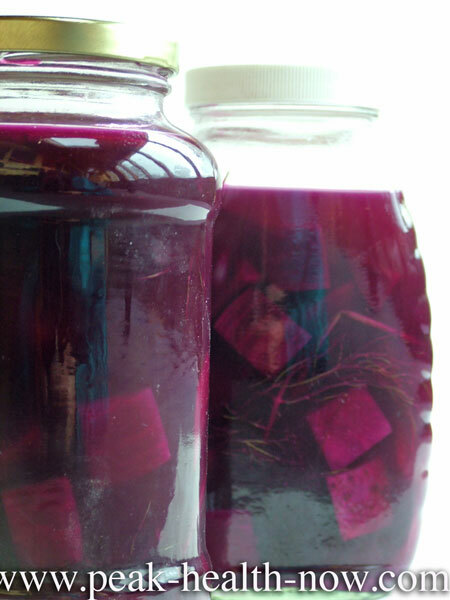 I have made my Beet Kvass with and without doing that and both ways worked fine. 10 - Once your Beet Kvass has cooled, pour off a few ounces and sip. Enjoy! 11 - NOTE: While I have never had any problem with spoilage when making Beet Kvass, I still suggest trusting your senses and not drinking any homemade beverage if you suspect it is spoiled.